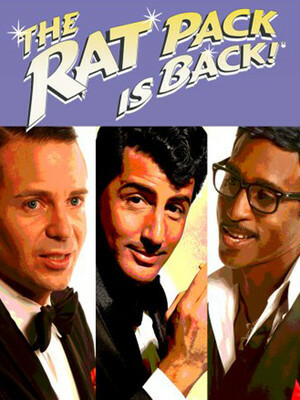 Why See The Rat Pack Is Back? Relive the days of the Rat Pack with Las Vegas' most famous Entertainers and their live 12-piece big band as they appeared live in the legendary Sands Hotel Copa Room. It's the only Vegas-based show with national touring companies and an award from the "Congress of the United States" and now its in fourteenth smash year with over 4,500 shows performed in over 34 states, 3 foreign countries and over one million tickets sold. With a stellar cast of some of the finest performers in the business, The Rat Pack is Back has been hailed as the next best thing to seeing the original Rat Pack. The quartet, comprised of eerily accurate impressions of Frank Sinatra, Sammy Davis Jr., Dean Martin and Joey Bishop, effortlessly evokes the charm of the Big Band era while transporting the audience back with classic songs like 'Fly Me to the Moon' and 'New York, New York'. Sound good to you? Share this page on social media and let your friends know about The Rat Pack Is Back at The Meadows. Please note: The term The Meadows and/or The Rat Pack Is Back as well as all associated graphics, logos, and/or other trademarks, tradenames or copyrights are the property of the The Meadows and/or The Rat Pack Is Back and are used herein for factual descriptive purposes only. We are in no way associated with or authorized by the The Meadows and/or The Rat Pack Is Back and neither that entity nor any of its affiliates have licensed or endorsed us to sell tickets, goods and or services in conjunction with their events.